In October 2017 ARS Ltd returned to Killerby Quarry to carry out investigations on one of the kettle holes that had been discovered during the initial investigations. 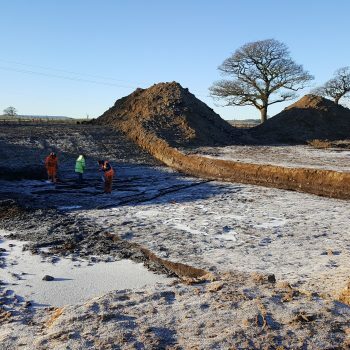 The topsoil was stripped from the kettle hole which allowed its extent to be recorded and then a single excavation trench was dug across its centre from north-east to south-west. 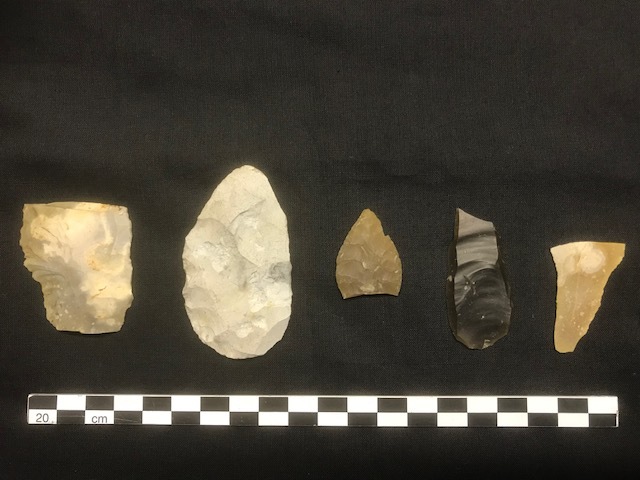 Upon excavation, the kettle hole was found to contain worked wood and so the decision was made to extend the excavation area to the north and south. 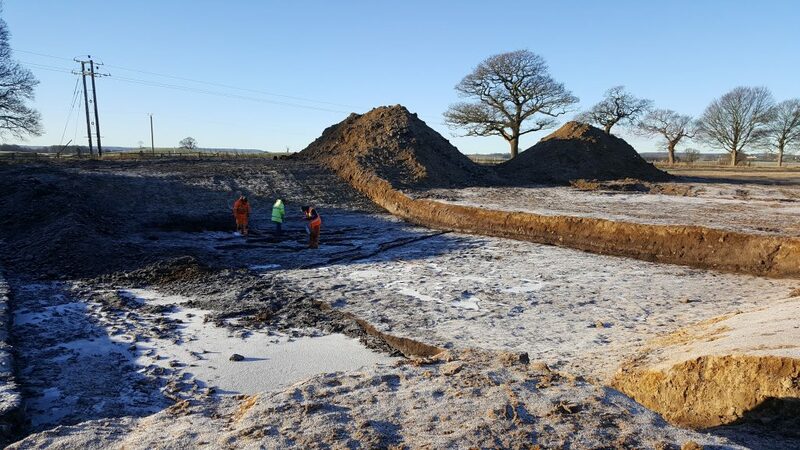 Careful excavation of the kettle hole’s deposits revealed a complex sequence spanning from the end of the last major Ice Age to the modern period. However, the most exciting discovery was that of a man-made timber platform extending out in to the kettle hole’s centre from its edge. 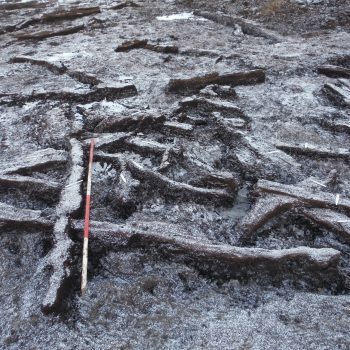 A total of 34 individual pieces of timber were recorded at different levels that had been laid on top of one another in order to create a dry surface on what would otherwise have been a very wet, boggy and unstable surface. Chipped flint tools such as blades, cores, scrapers and retouched blades were found amongst the timbers as well as a stone that is believed to have been used for softening animal hides. A number of cattle teeth were also found around the timbers and these, along with the hide softening stone, have been interpreted as being the possible remains from processsing animal skins and tanning leather, with the platform being used as a working surface and the pond area beyond used as a liquid bath for tanning the skins. Environmental samples taken from the kettle hole deposits revealed very high quantities of micro-charcoal in some of the layers. 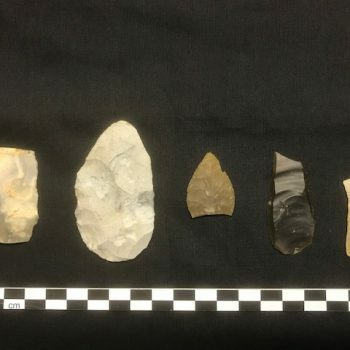 This provides rare evidence for human activity in the surrounding landscape during the Windermere Interstadial (warm period dating to 13000 cal BC – 11000 cal BC) and also the early Holocene (9700 cal BC – 4000 cal BC) when people were using the kettle hole and were most probably making and using fires. 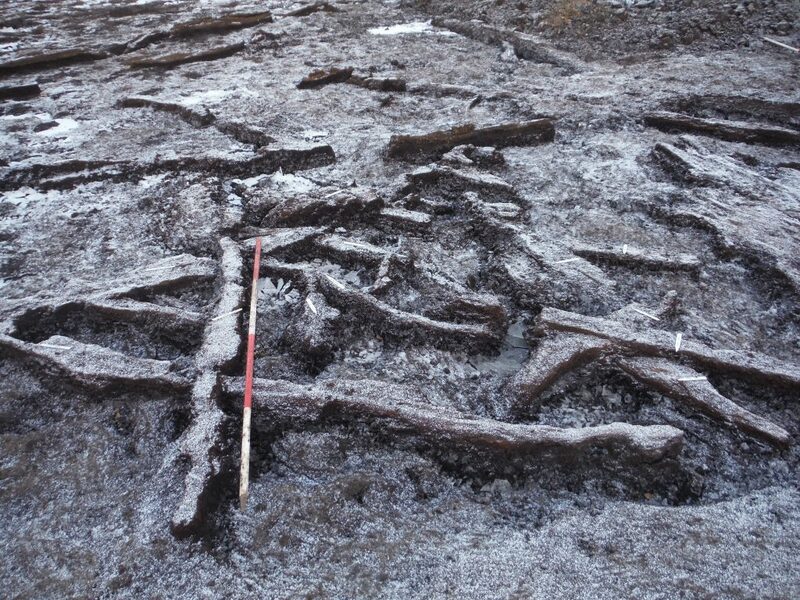 Also found during the excavation was a later addition to the Late Mesolithic timber platform of a large posthole with the remains of a large oak timber post still in-situ. Smaller pieces of hazel and willow had been wedged down the sides of the post to keep it upright, and radiocarbon dating has revealed that the post was a later addition to the structure of the timber platform. Other finds included patches of burning, pits and other post features, some of which dated to the Neolithic and Early Bronze Age when early farming groups settled in the area. Click here to download an illustration of the trench section that was excavated through the kettle hole and shows radiocarbon dates and sample tin locations.